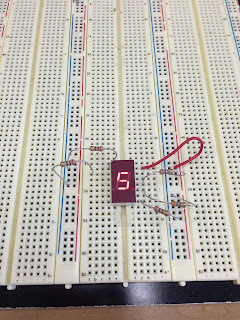 Check the manual of 7 segment display. Pdf document’s page 5 (or in the document page 4) circuit B is the one we have. 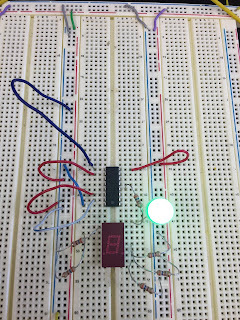 Connect pin 3 or pin 14 to 5 V. Connect a 330 Ω resistor to pin 1. 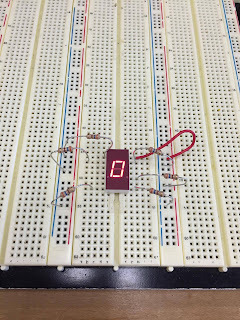 Other end of the resistor goes to ground. Which line lit up? 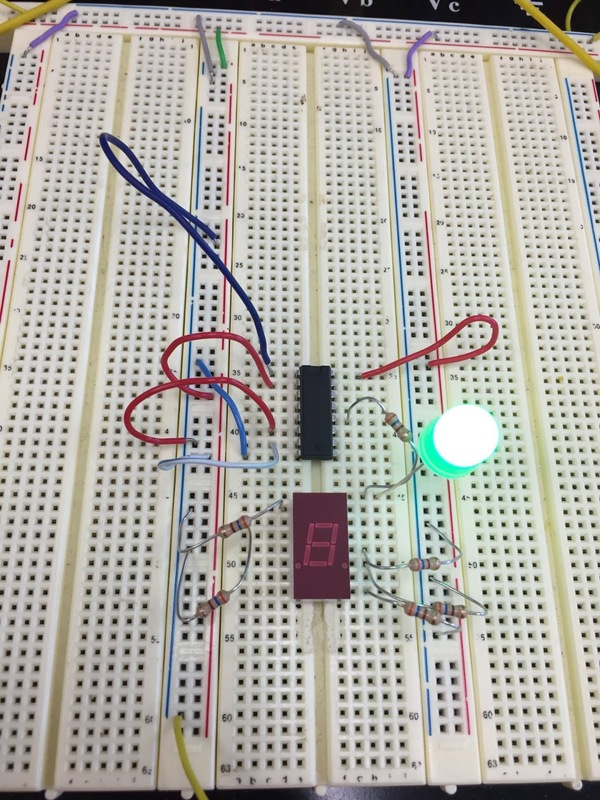 Using package dimensions and function for B (page 4 in pdf), explain the operation of the 7 segment display by lighting up different segments. (EXPLAIN with VIDEO). 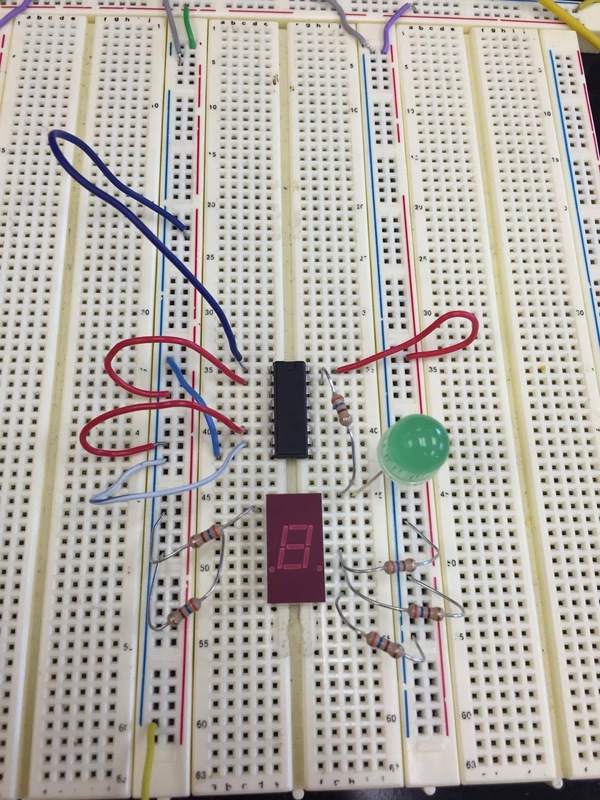 Depending on what pin you put the resistor is is what will light up on the 7 segment display. 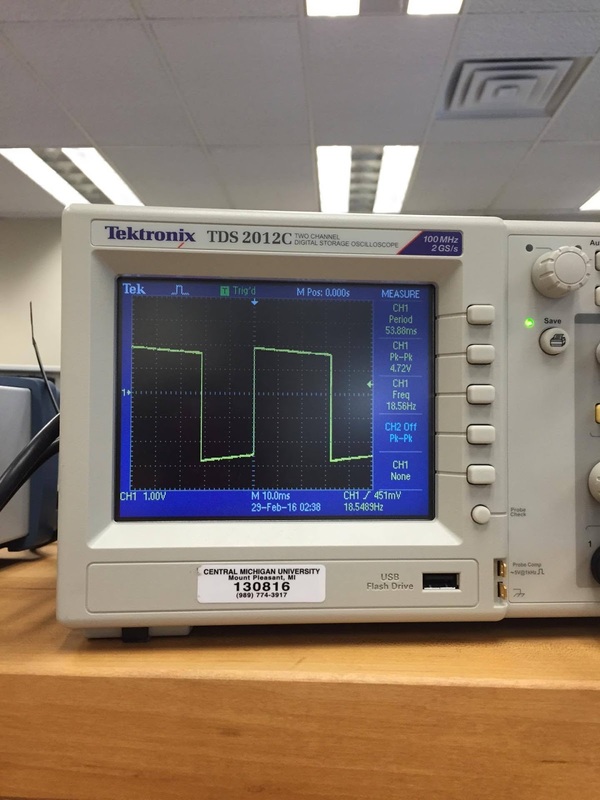 Display driver (7447). This integrated circuit (IC) is designed to drive 7 segment display through resistors. Check the data sheet. 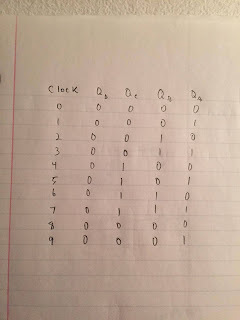 A, B, C, and D are binary inputs. 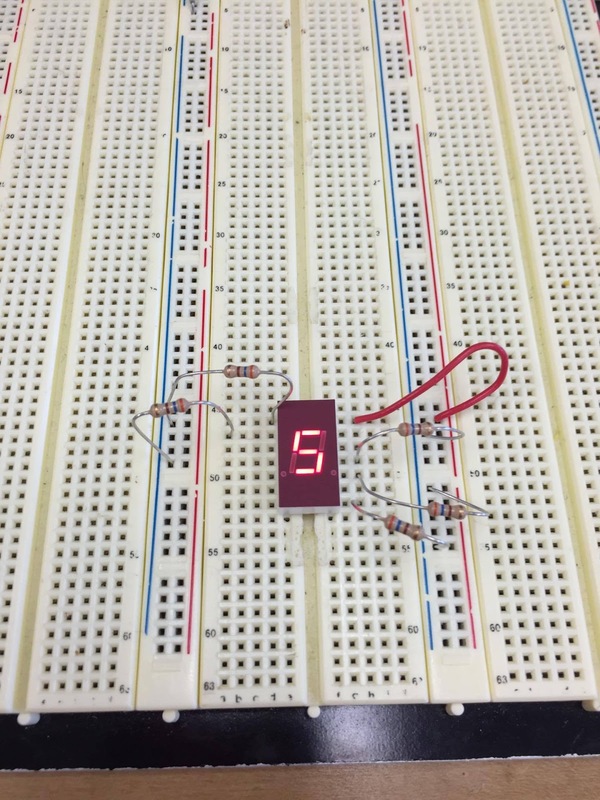 Pins 9 through 15 are outputs that go to the display. 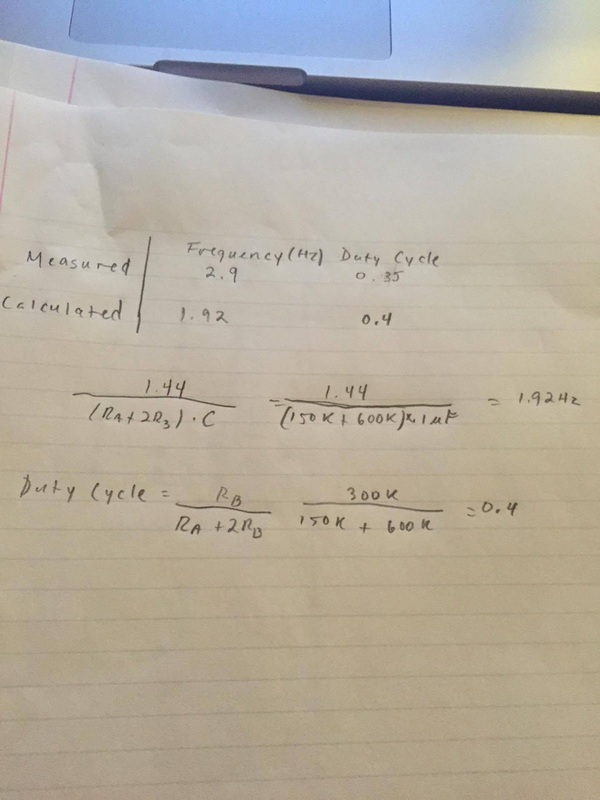 Pin 8 is ground and pin 16 is 5 V.
Does your frequency and duty cycle match with the theoretical value? Explain your work. The measured and calculated were fairly similar. 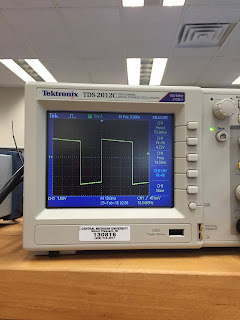 The frequency was off more than the duty cycle. 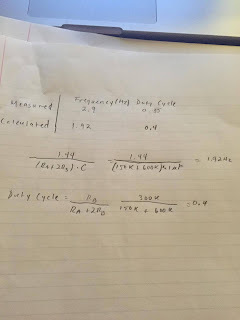 The calculated values can be seen above by using the equations written down. 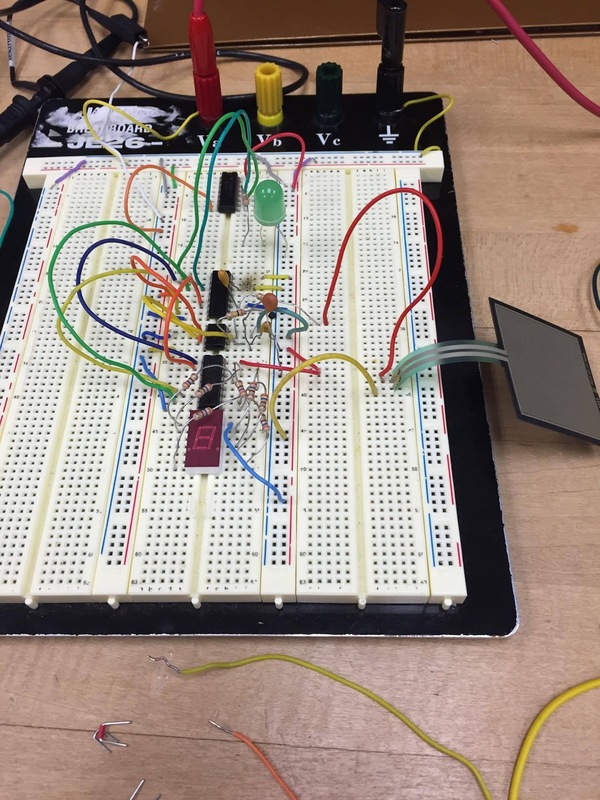 With the force sensing resistor added in series it is possible to get an output and also modify the frequency based on the amount of force added to the sensor. 5 V: pins 4, 11, 16. 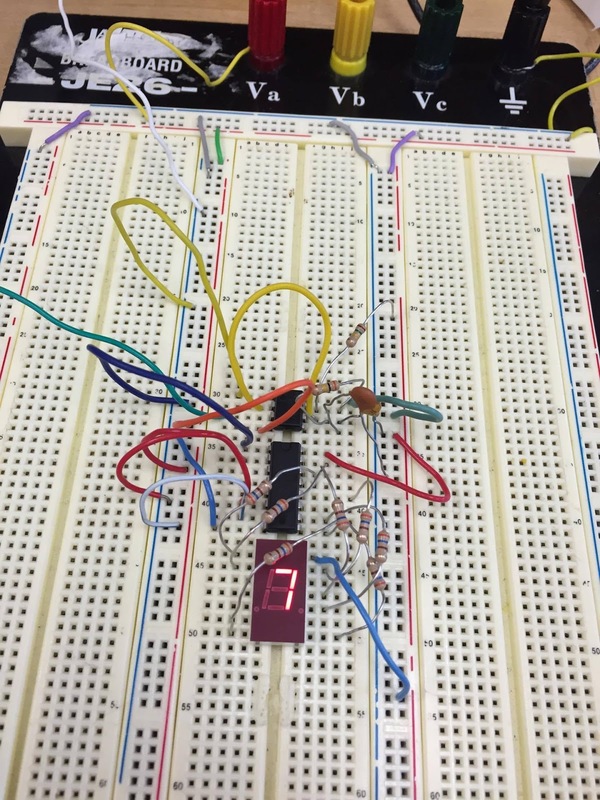 0 V (ground): pins 8, 14. 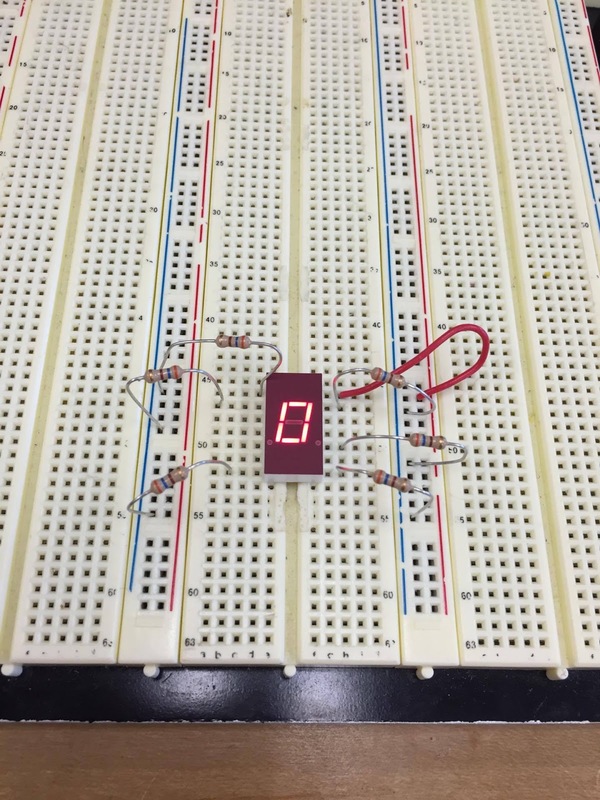 10 µF capacitor between 5 V and ground. 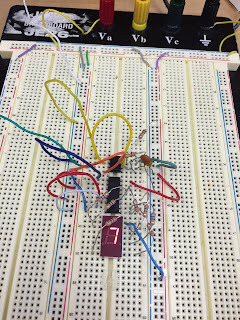 7486 (XOR gate). 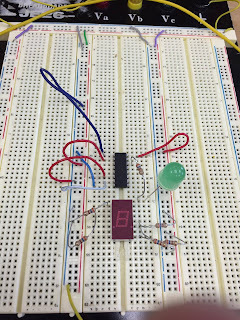 Pin diagram of the circuit is given in the logic gates pin diagram pdf file. Ground pin is 7. 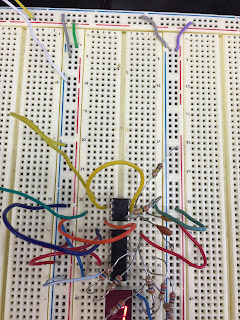 Pin 14 will be connected to 5 V. There are 4 XOR gates. Pins are numbered. 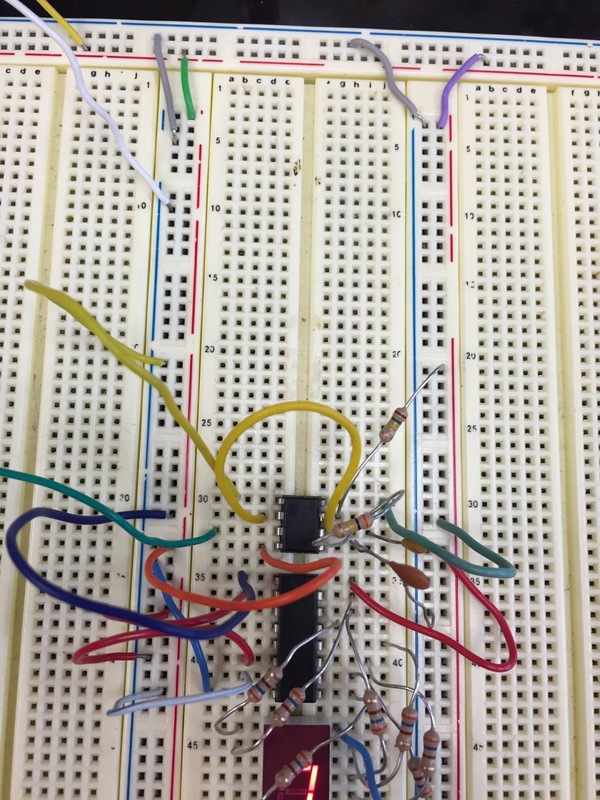 Connect a 330 Ω resistor at the output of one of the XOR gates. 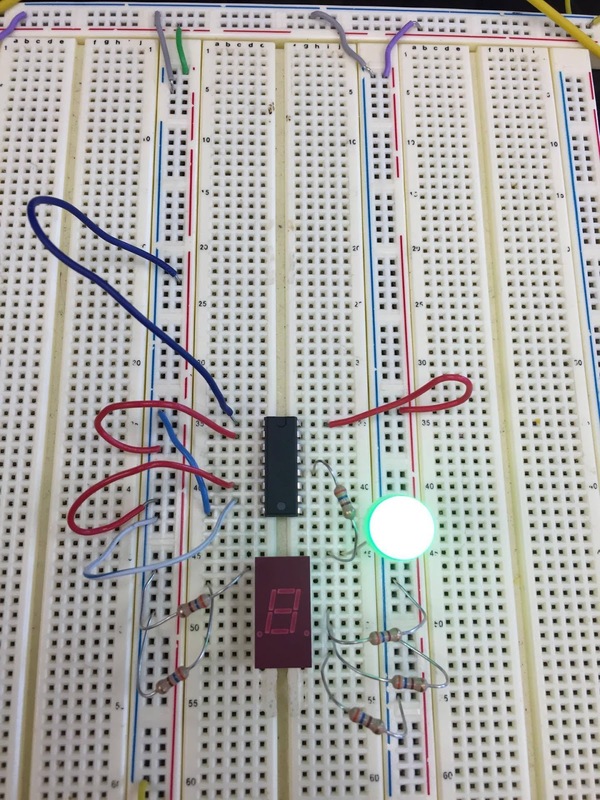 Based on the table from the 7447 part of the lab it is possible to pre determine when the light will be on based on the truth table. 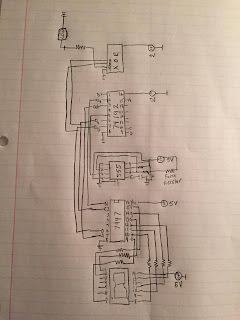 The circuit is extremely messy and hard to see but this one was rushed. I had everything done and recorded but my phone broke and I lost all my videos and pictures. 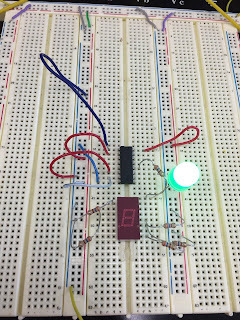 For the AND gates and with the truth table it is possible to either use C and D or A and B to determine when the light will turn on. 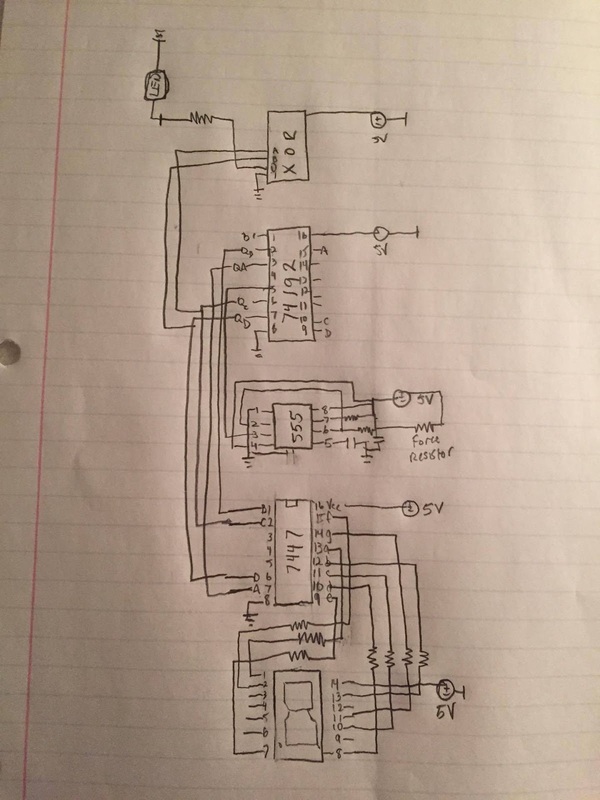 For input A and B the light will turn on with an AND gate at 3 and 7. 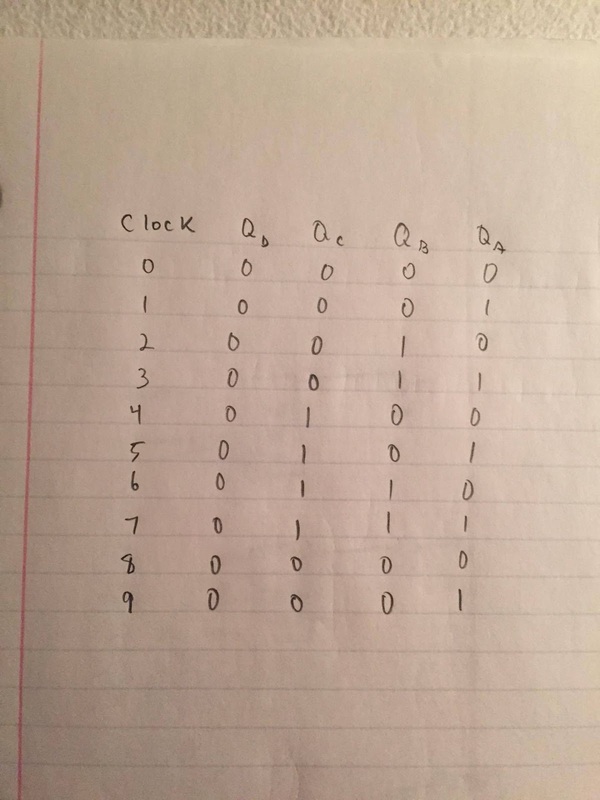 For inputs C and D the light wont turn on as the input never has 1 for C and 1 for D at the same time. 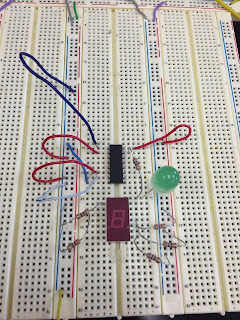 For the OR gate the lights will be off only at 0, 4 and 8 as they have values of 0 for both A and B.
I like how you used three short videos to show 2.b, they get the idea across in less then 10 seconds. I would just work on finishing it and you will be all set. Thanks! short videos seemed to be better to show the inputs that I choose for the circuit. Hopefully can finish this blog up soon, way behind this week.